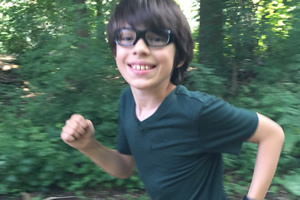 Following is a conversation I had with my (then) 11-year-old son (ADHD, Asperger’s, giftedness) about our special Morning Routine, a six-step routine we’ve been doing since January 2016 in the hopes that it would help our days be more productive, happy, energetic, and focused. Spoiler alert? It’s working. This is an edited transcription of Episode 9 of the TiLT Parenting Podcast. To listen to the full episode, click here: Episode 9: A Conversation with 11-year-old Asher About His Game-Changing Morning Routine. Last summer during a run, I listened to an episode of Pat Flynn’s podcast Smart Passive Income in which Pat was following up on an interview he’d done with Hal Elrod, author of the book The Miracle Morning: The Not So Obvious Secret Guaranteed to Transform Your Life Before 8 AM. Hal’s book outlines a simple morning routine that Pat said had totally transformed his life. As a side note, I am always looking for tools to share with Asher that can help him more consciously go about his day. I consider this a huge part of helping him develop his executive functioning skills and it’s a major focus of how I approach our time in homeschool. Debbie: I think you were kind of resistant to the idea of reading The Miracle Morning with me, initially, weren’t you? Asher: What? Me? I would never do such a thing. Debbie: So we kind of broke it down and took the whole fall to read the book, usually just one or two chapters each week. Then we set a goal of starting the new year with some sort of morning routine, but we wanted to make sure it worked for us. Do you remember how we did that? Asher: Well, we customized it. We thought about what worked best from our past experiences and also what sounded good to us. Hal’s book The Miracle Morning is based on the idea that when you consciously start your day doing activities that reinforce what you want to be creating and doing in your life, you’ll be much more likely to achieve those things. While a lot of the content of the book is geared toward inspiring adults to have more fulfilling lives and jobs, in our discussions about the book we focused on the notion of being more purposeful and achieving our goals. I know Asher has a lot of goals he’s working toward, most of which at this particular moment are related to successfully completing missions in the video game, Kerbal Space Program. The point is, Asher was up for giving it a try. And I didn’t really care what his goals were. I just wanted to see how starting off each day with a morning routine that is about presence and positivity and intention would impact him. So, in my book it was a win-win. I didn’t really care what his goals were. I just wanted to see how starting off each day with a morning routine that is about presence and positivity and intention would impact him. Debbie: Do you want explain what exactly the Miracle Morning is? Asher: It’s where you do some certain activities in the morning like meditation and reading and exercise and visualization and affirmation and that’s it. And you do them in the morning and you get to choose how you do them and then basically the effect is to actually make you a better person. It has certainly helped me be less grumpy. Debbie: Really? You think it has? Asher: Yes! The day when I didn’t do the miracle morning and woke up really early? Asher: I was really, really grumbly. Debbie: Let’s take a step back for a minute. Would you mind sharing with us what your personal morning routine looks like? What are the different steps to it? Asher: Yeah, well I start with one-minute mediation. And then we do some affirmations. Debbie: How would you describe an affirmation? Asher: It’s when you make statements about yourself, like: I am totally not arrogant. I’m like the humblest person in the whole universe. And eventually if you believe those things then they actually make you the humblest person in the entire universe. Debbie: Is that what your affirmation is? I’m the humblest person in the universe? Debbie: Okay. That was just an example. Debbie: All right. So you said it’s mediation then affirmation. What else do you do? Asher: Then we do five minutes of visualization, which is my favorite. Debbie: What is visualization for you? Asher: It’s when I sort of zone out and visualize the things that I’m going to do and them going successfully. And then I apply that to my actual day. Debbie: Cool. All right, so what comes after visualization? Debbie: Those are not jumping jacks. Those are hand flaps. Debbie: So, what happens after the exercise? Asher: Then we do a bit of reading. Well, I say a bit, but I usually read for at least twenty minutes. Debbie: What are you reading? Asher: Well, you know books about quantum physics. Debbie: So, it’s light reading. Debbie: And then after reading, what’s next? Asher: Then we do a bit of journaling. That’s sort of the hardest part for me. But then at the end it goes well. Debbie: What does your journaling entail? Asher: It entails what I plan to do for the day. Debbie: Why do you think that’s the hardest part for you? Asher: Because it’s really hard to think about things to write about. And that’s the whole thing—our morning routine. One minute of meditation for Asher, which basically looks like him sitting on his bed with his eyes closed breathing deeply. Then he reads his affirmations out loud—he has several different ones and they’re written down on a sheet of paper he likes to keep in his bedroom. Next he comes into bed with me where we do our visualization together. Right now our visualization consists of listening to anywhere from one to three songs. Our music list right now is Enya, Badly Drawn Boy, and Charles Atlas. And we lie side-by-side with our eyes closed imagining what could be. I just feel nicer. And I often do the things that I visualized doing. It’s not like all of a sudden my days are nine hundred percent better, right? It’s like they’re a bit better. They’re better than normal. That’s it. After that is exercise which, right now, is some sort of ridiculous version of jumping jacks. Next, reading and then journaling. And while at first journaling was a really hard one for Asher, it’s actually become one of his favorites. He’s been using that time to plan his goals for the day and doodle these technical drawings of what he wants to build in Kerbal Space Program. It’s his way of visual problem solving. Debbie: I’d love to know if you could describe to us, beyond just not being as grumbly, how you feel doing the Miracle Morning has positively impacted you? Asher: I just feel nicer. And I often do the things that I visualized doing. It’s not like all of a sudden my days are nine hundred percent better, right? It’s like they’re a bit better. They’re better than normal. That’s it. Debbie: Do you feel like taking the time mediate and visualize and do your affirmations and so on helps you be in a better mood? Do you feel like it’s helping you stay more focused or have your days go more the way that you want them to go? Debbie: Do you think this is something that could work for other differently-wired kids too or do you think this is unique to you? Asher: For sure for other kids! Asher: Because. I mean you’re doing it and you’re not even a kid. Debbie: This is true. So do you think other kids your age would be into this? Asher: I think so, yeah. It’s sort of fun. You get to imagine your day going perfectly. Debbie: If a parent wants to encourage their child to do this or thinks it will be a good thing for them, what could they say to make it sound more interesting? Because I know that you had some resistance to this whole idea at first, but you were willing to give it a try. You totally had an open mind, which is awesome. But, what would you say is something that could help other kids get that it’s a really helpful thing and could be beneficial? Asher: Well, they do have a part of the book that explains the basics of forming a new habit, right? It says it starts out hard and then it gets easier and easier and easier. And then you become completely used to it. It’s a habit. Debbie: So, you feel that’s what we’re doing now? We’re forming a new habit? I love that Asher is forming this habit and developing the discipline to follow a routine that can have positive side effects. But even more so, I love that he has noticed the positive side effects himself and therefore is motivated to keep going. I’m happy to say that we’re still doing our morning routine, it’s been nine months at this point and even on Saturday mornings when I get up early to run with my running group, Asher does the routine all by himself. And when days don’t go well, he often attributes it to skipping his routine that day (he sometimes takes Sunday off). Debbie: You think if we check in on this podcast six months from now we’ll still be doing the Miracle Morning? Debbie: I hope you’re right.